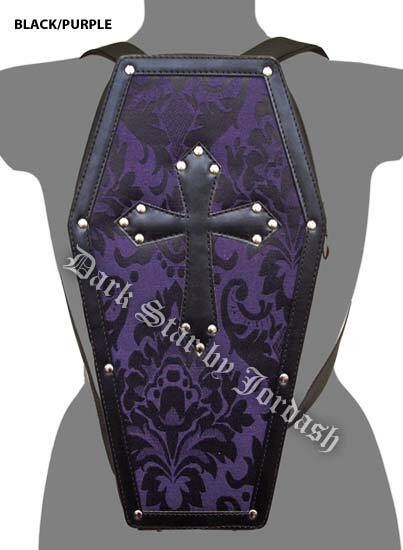 Reviews: Dark Star Purple Gothic PVC Coffin Cross Stud Backpack Purse [DS/BG/7519P] - $49.99 : Mystic Crypt, the most unique, hard to find items at ghoulishly great prices! I so love my new purse!!!! Looks so much better than picture but then sometimes pictures just can't do justice to certain things. It is nice and roomy too fits all my stuff perfectly. Talk about fast shipping only two days which usually things take longer than that. I also couldn't believe how well priced it was extremely reasonable I am so looking forward to buying more stuff now that I know this site also caters to larger size women as well. I would highly recommend you look through out the site because I was blown away with all the awesome stuff this place carries I know all of you who read this are bound to find something you just can't live without and have to have and now you can finally have it as I finally have and as I said before for extremely good price. From one very extremely Happy Customer!!!! !